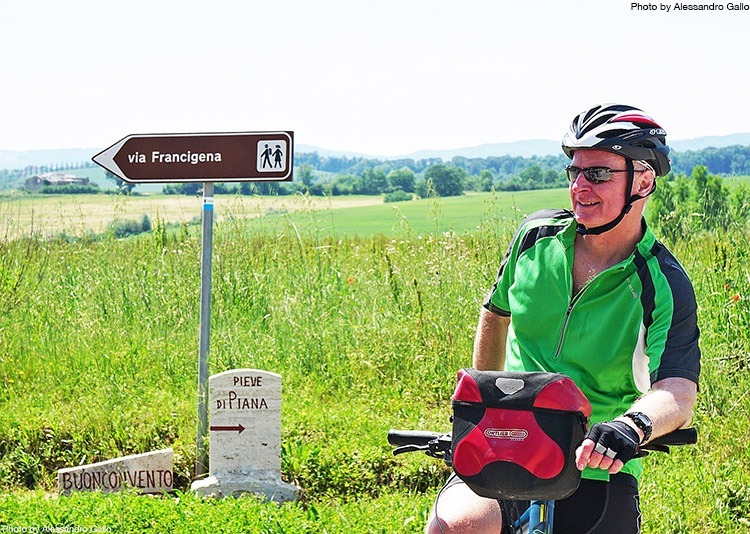 Join us on this guided cycling holiday in Italy where we'll be tracing the steps of the Via Romea Francigena, an ancient route between the northern regions of Europe and the south, carrying merchants, armies and pilgrims from as far as Canterbury to Rome and on to Jerusalem. Now, the Via Romea Francigena is a network of tracks and roads which are followed not only by faithful pilgrims on their way to Rome, but also walkers and cyclists who are looking for an exciting journey. We have chosen to start our adventure in San Gimignano, considered one of the gems of Tuscany and home to one of the 80 mansions where the Archibishop of Canterbury stayed during his return north after his ordination by Pope John XV in 990. Heading south, we'll follow the the Via Romea Francigena on quiet, country lanes, ancient Roman roads, over rolling hills, through woods, towns and villages... a great journey through stunning Tuscany! The route joins up some of the major Tuscan highlights, such as Siena, Montiriggioni and San Quirico. Staying in a range of good quality small hotels and agriturismi, you'll get to experience true Italian hospitality and indulge in some delicious local cuisine. As we leave Tuscany and enter Lazio, the landscape changes as well as the feel of the towns. The journey south, through varying landscapes and changing terrain, using sections of the EuroVelo 5 route, leads to the outskirts of Rome where our own pilgramage comes to a dramatic end, riding into St. Peter's Square. We also have a mountain biking version of this trip available which follows alternative, off road routes along the Via Romea Francigena.